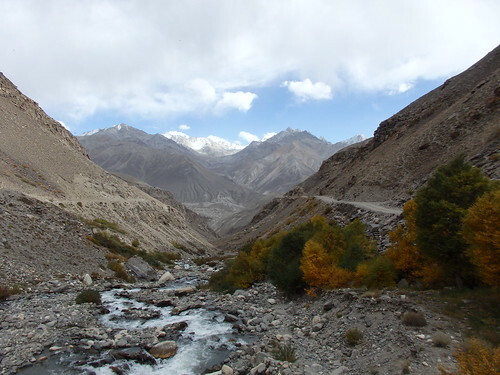 From Khorog you have a couple of choices regarding which road to take. 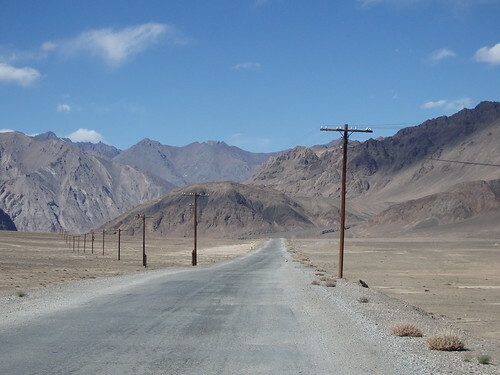 The main Pamir Highway (M41) leads up into the mountains, while a southern route continues to follow the Afghan border as the Wakhan corridor narrows. Recently there was only one choice, as the M41 was closed due to big landslides a couple of months ago. A whole village was wiped out and the road had been replaced by a lake in one place. 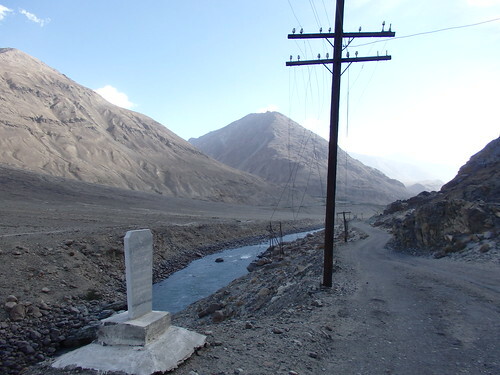 The main road had recently been repaired and was passable once again. 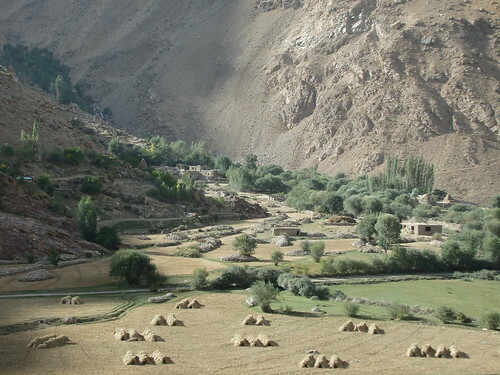 It was the shorter, better quality, easier route to follow but I was enjoying my time in the region and so I decided to take the Wakhan route anyway. 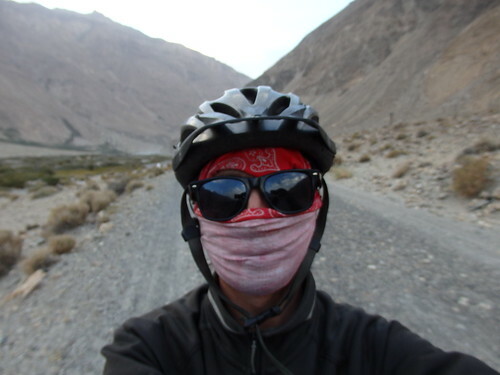 I was up for the challenge and I was more than happy to do a few days extra cycling here: I have, after all, cycled all the way to Central Asia primarily to ride the Pamirs. I really I enjoyed having cycling company, as ever, but I was also happy to be by myself. After spending so long solo it seemed right to do the majority of this section alone. I miss the opportunities that present themselves to me when I’m alone – I’m more vulnerable to the bad stuff, of course, but people go that extra mile to meet and help me when I’m just one person. 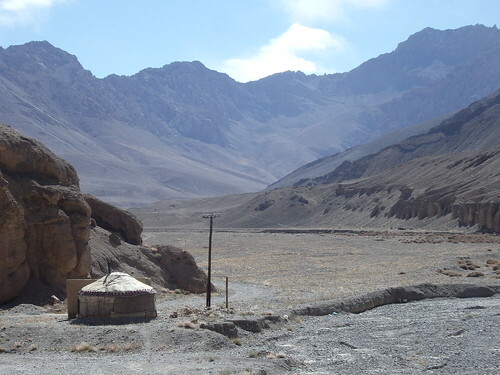 It was like that from the start leaving Khorog. I stopped a bunch of times after being invited for chai and was donated a bag full of fruit by a roadside seller. 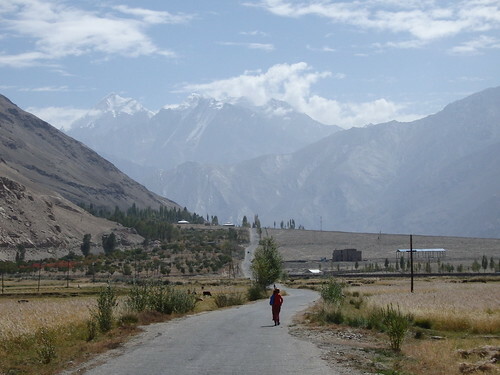 The Wakhan valley was similar to how it had been the last few days. Wide and green at times, then almost claustrophobic at times with narrow cliffs hanging over the road. The Afghan slither beside me became more thin. 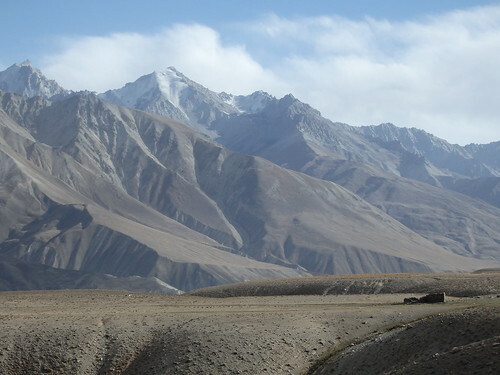 The strategic Wakhan Corridor buffer (formed as a result of ‘The Great Game’ dividing Russian/British territories) narrowed and I could see the white-peaks of the Hindu Kush range marking the Pakistan border just behind the Afghan cliffs. At the same time the the valley I was cycling in began to widen. I could never have imagined so much sand could be here. It was super windy… you know one of my least favourite combinations in the world? Sand and wind. 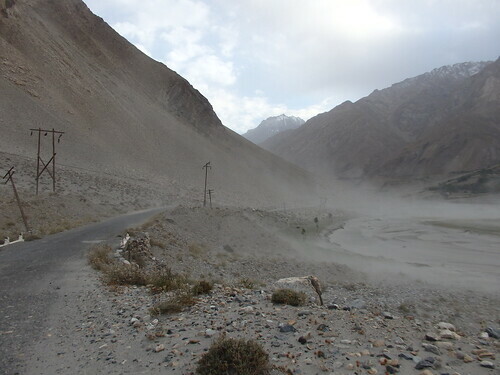 I’ve spent many weeks cycling through deserts but the worst sandstorm I’ve experienced was along this road. I got completely stuck in a couple of them and was emptying sand out of my bags and clothes for days. I passed lots of memorials along the way. 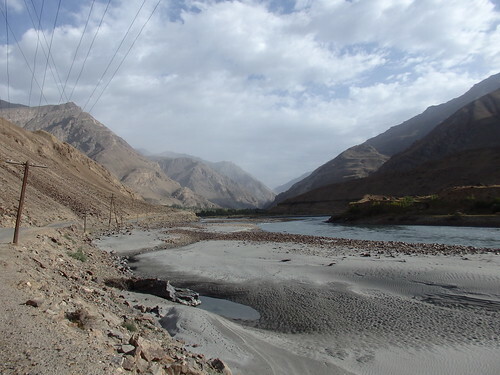 I thought they were all from cars that had driven off the edges but apparently many of them were for soldiers that had died when there were gun battles between the Tajiks and Afghan Taliban across the river a while ago. (I’m glad I didn’t know that at the time). 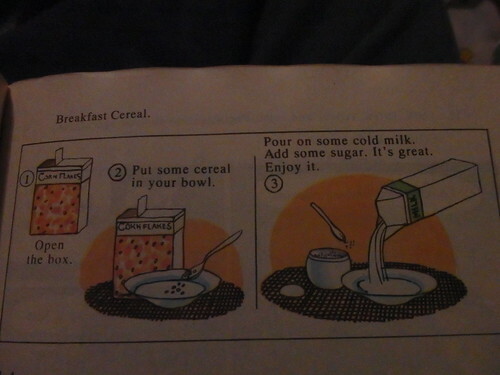 The language was changing too, and confusing me in the process. 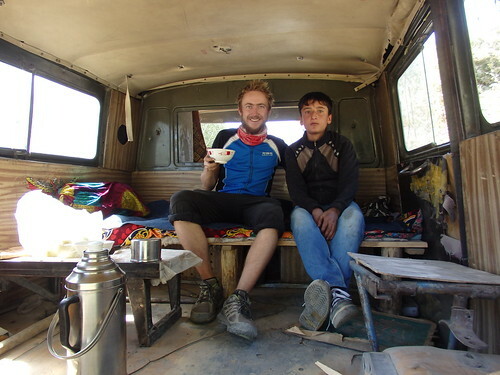 A local kid and his mum called me over and invited me into a makeshift van for a drink. 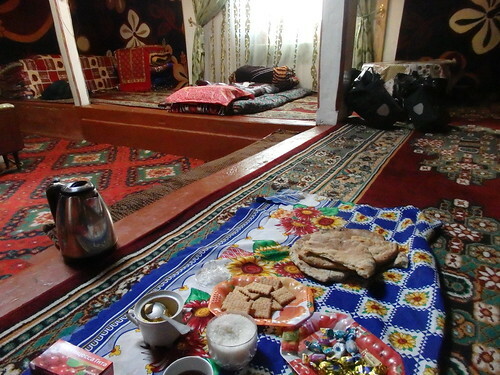 They drink their tea from small bowls everywhere in Central Asia, but this time I was given a soup sized one. I got excited as they poured milk tea in (it’s been nothing but green of late), but then was left a little confused as they instructed me to rip up bits of bread and chuck them into the bowl too. I gave it a curious sip… Was that salt in there? I tried again. Yep – definitely salt in the tea along with all the mushy bread. 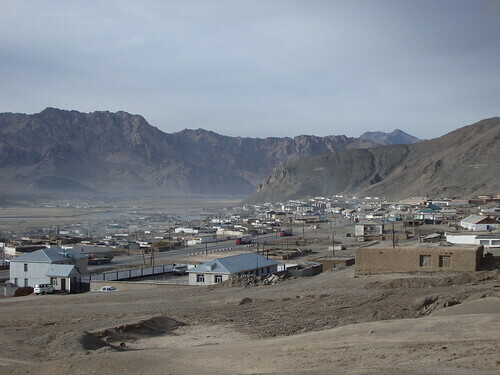 I later learnt that this is ‘sir cay’ – something they’re really into in this region, but most definitely not for me. I stopped in one village to buy some food for camping. A bunch of local guys clearly thought my shopping was amusing – a tin of kidney beans, some tomatoes and a beer. I delivered them one of the most advanced Russian sentences I’ve managed: ‘ pivo a palatka = khorosho’ which (I hope) means ‘beer and tent = good’. They clearly found that funny and gave me some food. One of them (who’s breath smelt particularly strong of vodka, but then again who’s doesn’t here?) seemed to invite me to his home. I didn’t really understand him, but I try to always say yes to everything these days so followed him into the village anyway. Like everyone I meet, they were a lovely bunch. Their house was charming and so was the village. The only bad bit was the toilet, but I’m used to that by now. I asked where it was and my host showed me the communal doorless hole-in-the-ground at the end of the street and handed me a bit of newspaper (good thing I always have toilet paper with me). The women sat on one side while us lads got the vodka out. After dinner the men started chucking tobacco in their mouths until they couldn’t talk properly through their numb mouths and I passed out swiftly after my many nightcap shots. That was the end of decent road. Goodbye asphalt! See you soon, I hope? 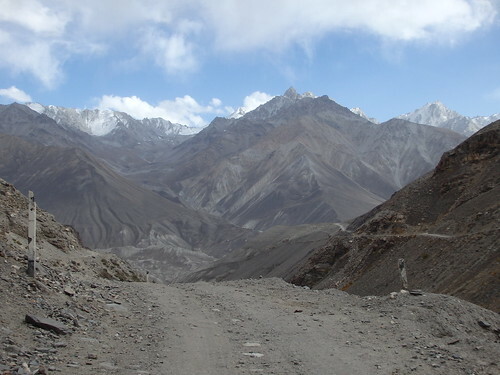 These are the kinds of ‘roads’ you even have to push downhill! But it wasn’t the end of civilisation. Not yet, at least. Now that the valley was wider people were farming everywhere. 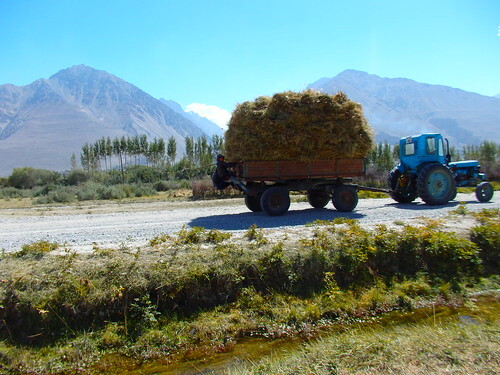 All families were out marching their cows and donkeys across the fields trampling harvested hay. I stopped for a tea break with these guys (above). The kid wanted a play with my camera so I passed it over. He took lots of pictures of their cow and then chased a couple of older girls who very clearly didn’t want their photo taken. Then another kid wandered over, clearly jealous of the toy that was my camera. He proceeded to take a million snaps of absolutely everything, but mostly himself. I wonder if there’s any part of the world that doesn’t know what a ‘selfie’ is? One of a thousand selfies I later found on my camera! 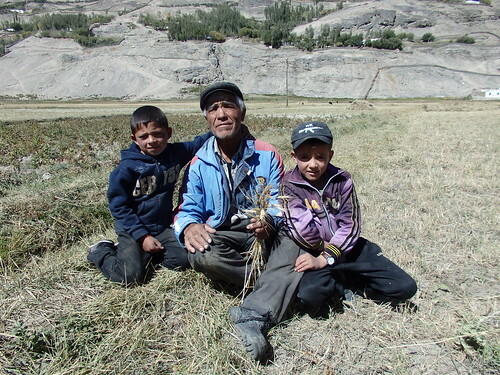 The local kids continued to be a highlight of my Wakhan experience. Even the tiniest of kids would come rushing out their houses to scream ‘hello!’ and ‘bye bye!’. The easy bit was over. 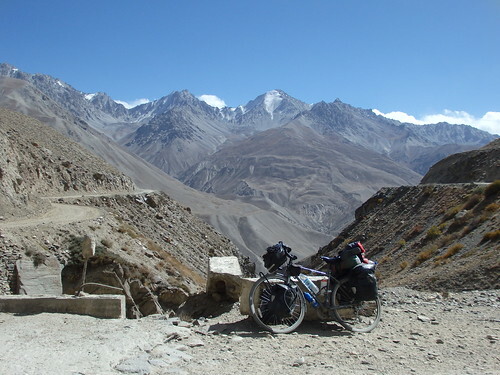 I stocked up and prepared for the long climb to Khargush pass – both nervous and excited about heading up to over 4,000m for the first time. I zig-zagged up the mountain side on an absolutely awful road. My tyres simply couldn’t grip on the steeper gradients and I ended up pushing a painful amount of the time. I think I managed about 40km the first day, and I was exhausted. 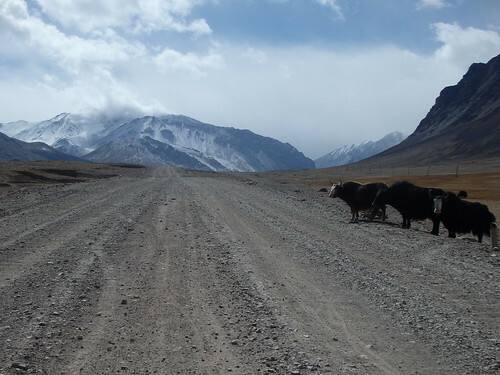 There was barely any traffic on this road, my most frequent interaction came from the shepherds herding their flocks down to the valley. I usually cross paths with shepherds at the very start or end of the day when they leave/return to the village but I think these guys were proper nomads returning from a whole summer in the mountains. With a fairly clear mime, the first shepherd asked me if I had a cigarette for him. I laughed at loud. What were the chances of me having a cig for you! The road was gorgeous. The next day I stopped to fill up water and take a break where the road crossed a stream. A rare car stopped in the same place as me and two guys hopped out. One of them starting talking to me in Russian. I told him I didn’t speak his language (one of the few other sentences I can put together in Russian) but he just kept on blabbing away. That’s my pet hate on this tour. People who just can’t understand you don’t speak their language, even when they talk closer to your face and as loudly as possible. Meanwhile, out the corner of my eye I saw the other guy walk about 3 metres from the road and squat down to have a poo beside us. I turned a little to give him some privacy (for my sake, rather than his) but he then squat scuttled like a crab back into my eyesight looking for a stone to wipe his arse with. Grim. 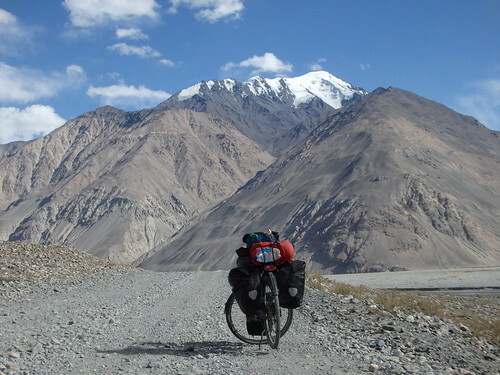 I turned away from Afghanistan and passed a remote military checkpoint before the last climb. Even after two whole days, I wasn’t going to make the pass today. 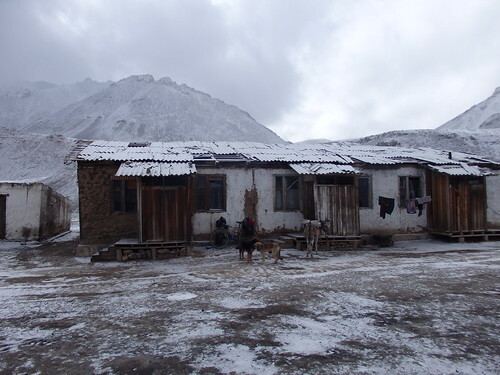 I’d been pretty cold the night before and so I was nervous about what it would be like sleeping at 4,000m. I didn’t have a choice and besides, I’d have to find out sooner or later! As soon as the sun disappeared the temperature dropped rapidly. I put all my clothes on and went to bed as quick as I could. 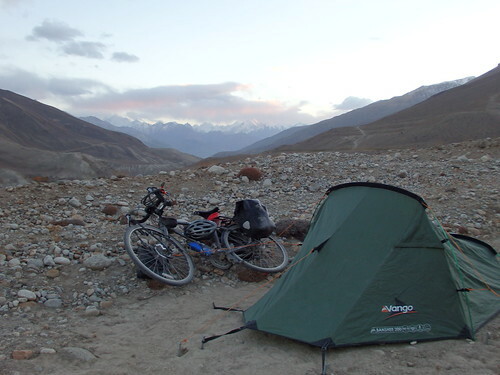 At 4am I woke up from the cold, shivering in my tent. When I say I had all my clothes on – I really mean all. Two T-shirts, a fleece, a raincoat and my coat on inside my sleeping bag. 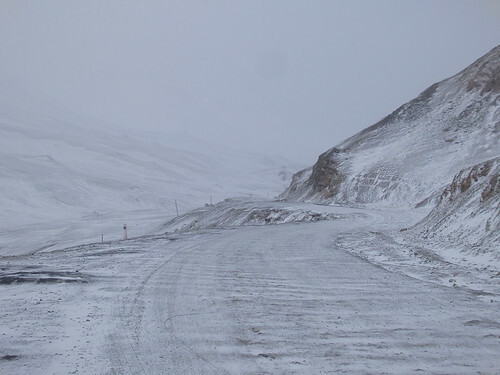 I don’t know how cold it was but a couple of other cyclists told me their thermometers had dropped below -10 at night in the mountains. My sleeping bag’s comfort rating is -7. It’s a crap sleeping bag but I think we can assume it was pretty bloody cold. I couldn’t get back to sleep. It was horrible. I walked a few circles around my tent to stay warm and then when the sun first hit the mountain side I scrambled up the rocks with my cooking gear and sat up on a ledge for breakfast, waiting for the sun to reach my tent. 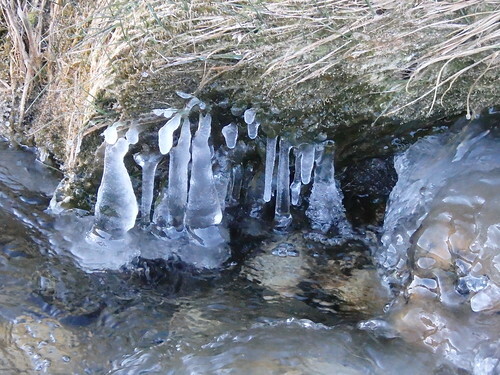 The fast flowing stream beside me had frozen over in places. Yikes. His colleagues were busy scrambling up the side of the mountain picking desert weed bushes and throwing them down to the road. I’m assuming that was what they burn to keep warm up here. I made one big push and soon I was over the top. 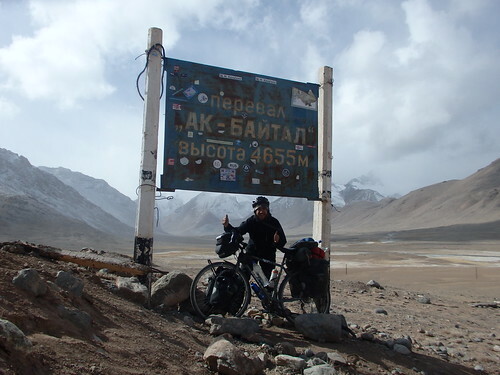 Khaurgush pass conquered. I probably say this too often but this one… Hardest climb of my life. Nearly killed me. 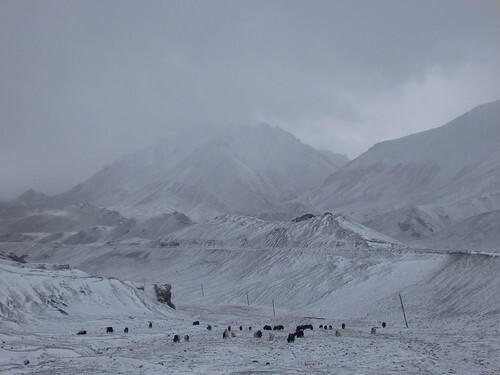 On the other side I rolled down into another world – the Pamir plateau. Sparse and moon-like and totally unlike anything I’d ever seen before. I descended a small amount and then suddenly rejoined the M41. Tarmac! What a feeling! It was almost worth the days of suffering just for that sensation of my bum gliding on smooth asphalt. In no time at all I reached the village Alichur. I’d planned a detour that would stall me a couple more days but it was simply too cold sleeping up here – so I opted for the direct route where possible. Alichur was just a bunch of low white houses plonked in the middle of nowhere it seemed, but I was glad to be back in some civilisation. 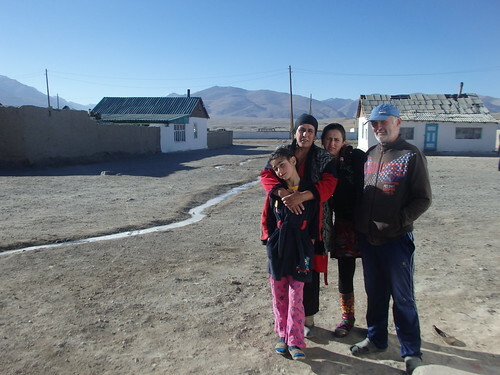 I found my first official homestay of the trip – a lovely family home at the end of the village. I’d planned on camping the whole thing – but in this cold? Not a chance! The homestay arrangements work pretty well and are a good example of how successful Community Based Tourism can be for everything. They usually cost about $10 a night and you get dinner and breakfast included. That’s a good deal for both the tourist and the locals. My host was the local English teacher and it was great to have someone to speak to. Considering how remote we were, her English was amazing. Considering she was the English teacher it was awful. I noticed that the faces were different up here. 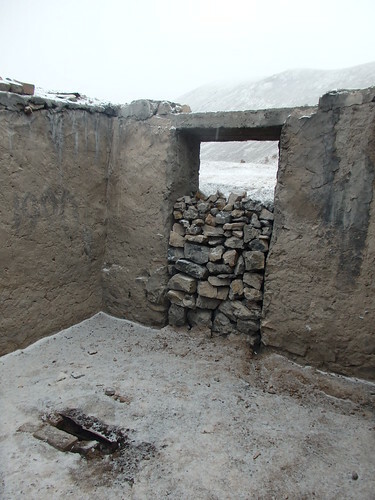 This was the first settlement with a large percentage of Kyrgyz people. I’ve now left ‘Tajikistan’ proper. 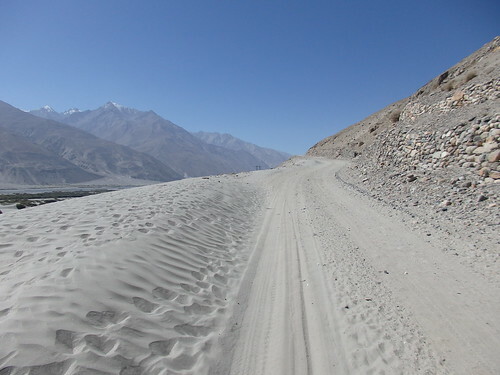 The road was like nothing I’ve ever seen before in my life – like nothing I ever thought even existed on this planet. Back on asphalt I was flying again, the wind blasting into my back. 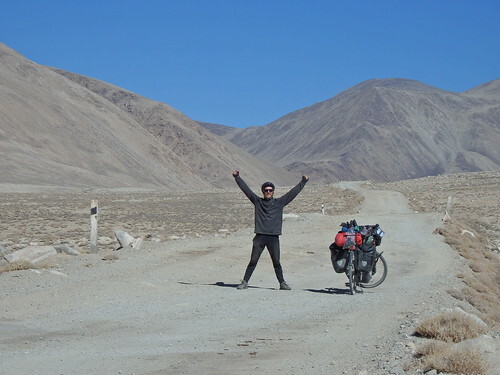 I cycled more than 100km in under 5 hours to reach Murghab. The last few days I’ve been struggling to reach 40km! 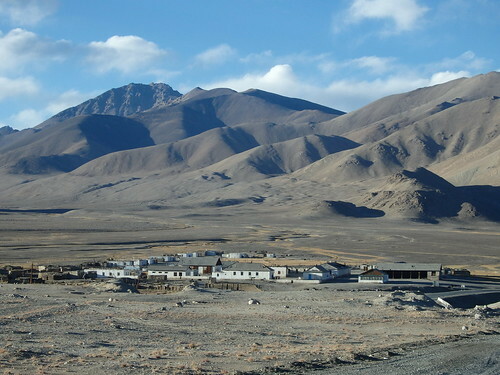 I though Murghab was supposed to be a proper town but it was just a big village. The only hotel in town had closed – apparently it’s already the end of the season. 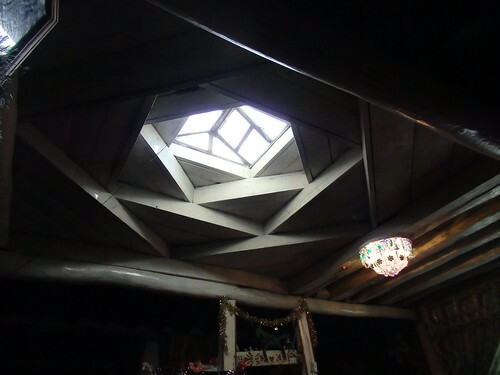 I stayed in a guesthouse nearby for the night. I wanted a day off but there was nothing to do here so I stocked up on some supplies and headed off the following morning. 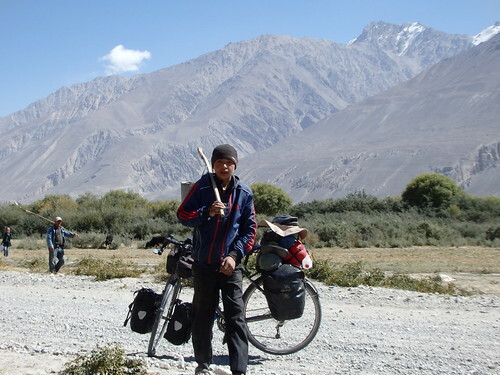 From Murghab I began to climb toward the highest pass of the trip. I wasn’t feeling well again – I feel like I’ve had a bad stomach the whole time I’ve been in this country and it’s taking it’s toll on me. My body doesn’t convert food into substantial energy when I’m sick and I’m running at 50% much of the time as a result. I’m not sure if it’s the food or water but something is doing regular damage and I’m (quite literally) sick of it. For the first time I began to really suffer from the altitude. I was now enduring a great combo of illness. Every morning I’ve woken up on the plateau out of breath but it’s not been unbearable. Today was something different. I had a splitting headache and was constantly short of breath. Labored breathing is not a nice feeling. I was rising gradually, but the higher I climbed the worse I felt. I had to stop every 200m to monitor my breathing and on a couple of occasions I had to sit down worried I might faint. Barely a car passed all day – this was not the place for anything to go wrong. I’d hoped I might get over the pass but that clearly wasn’t going to happen. I seemed to recall someone saying there was a tea house near the pass but I couldn’t remember which side it was on. I had a big decision to make – camp here before I got any higher (the more I cycled the more insufferable the night time temperature would be) or continue and hope to find this house. One thing I’ve learnt to believe on this trip is that fortune favours the brave and so I pushed on. Just before the road began to snake up the last of the mountain I spotted the farm house with smoke blowing from the chimney. Hurray! I knocked on the door and could stay with the family inside. Not fun going to the toilet in this cold! 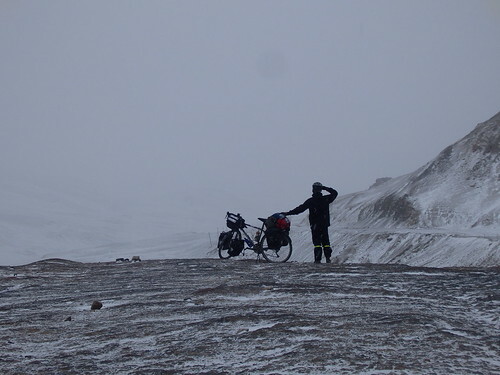 I didn’t like the idea of cycling in such icy conditions but once I’d started I changed my mind. It was simply gorgeous. 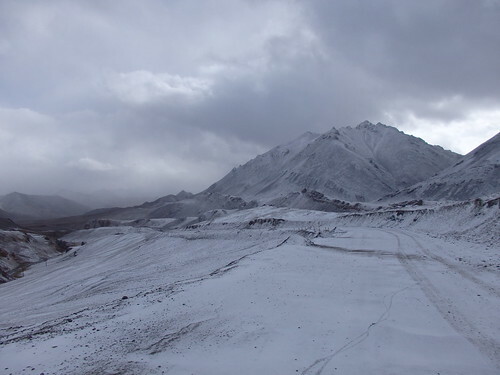 The landscape had completely transformed overnight and the results were magical. The climb to the top was slow – but tyres were sliding and I kept having to stop to catch my breath. 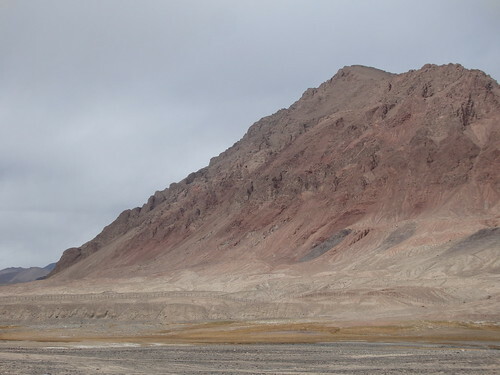 But eventually, as always, I made it – 4,655m. Crazy. After a short descent I was out of the snowline and back into the sun. 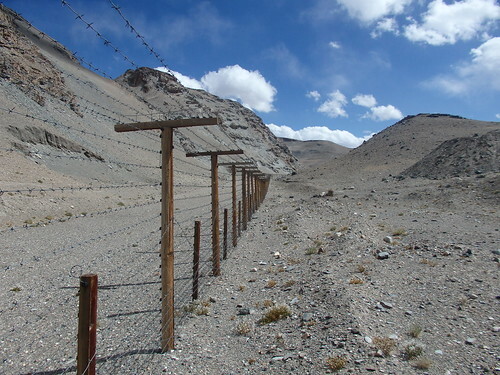 A long barbed wire fence lined the side of the road. I checked my map – was I that close to China? 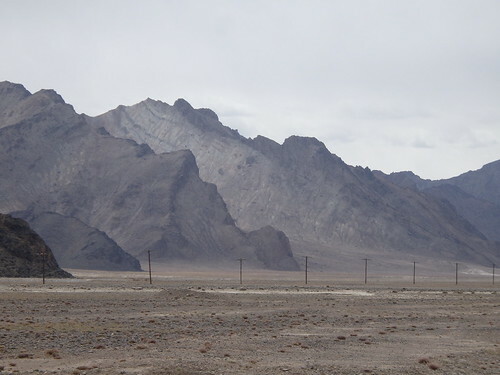 I recalled reading that the Tajik’s had recently given China a large chunk of their land but actually this was the outer edge of a large ‘buffer zone’ between the two countries. The fence was almost certainly built by the Chinese and had no doubt cost a fortune. 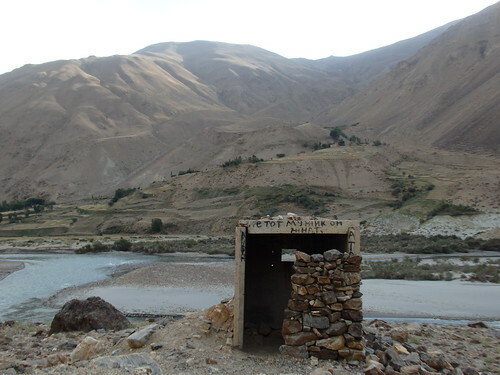 Slightly ironic next to the road on the Tajik side, falling apart all over the place. 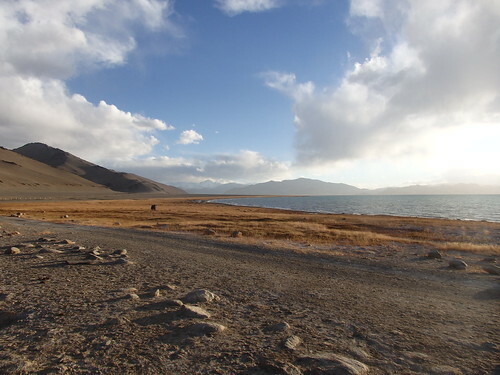 Soon I was at another landmark spot along the Pamirs – Karakul lake, one of the highest altitude lakes in the world. 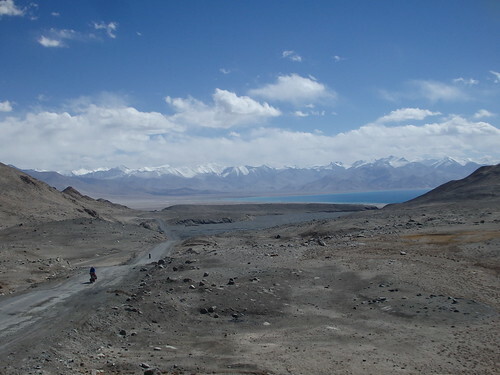 I can only name a few lakes off the top of my head and Karakul is one of them, thanks to my sporadic research of the Pamirs over the last few years. 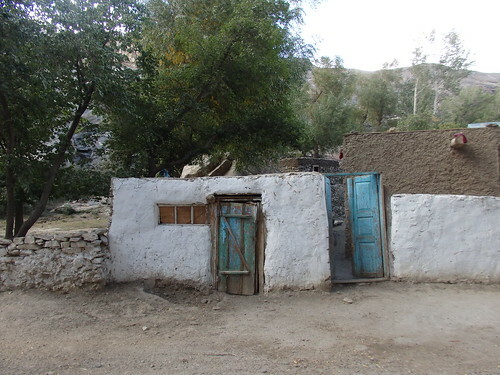 I stayed in a guesthouse in the village along with an Aussie couple. 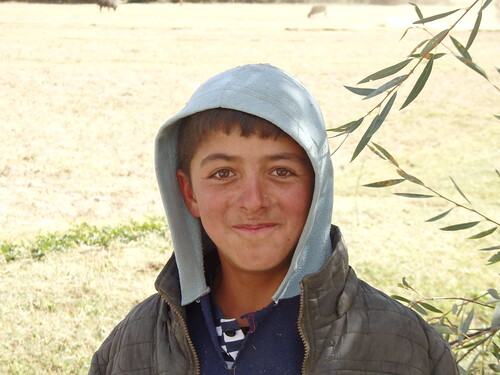 After chatting a while they turned to me ‘I think we might have met you at the Uzbek embassy in Ankarra’. Bloody hell it’s a small world! I had indeed briefly met them (not that I would have remembered) about ¾ month ago in Turkey. 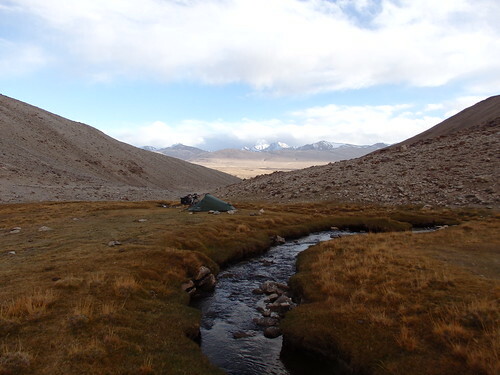 I left with them the next day, but when they stopped shortly before the last pass I pushed on – desperate to avoid another night camping above 4,000m. At the top I reached the border – a lonely post where a few bored looking soldiers asked me for cigarettes (what is it with this country an cigs!?) before stamping me out. 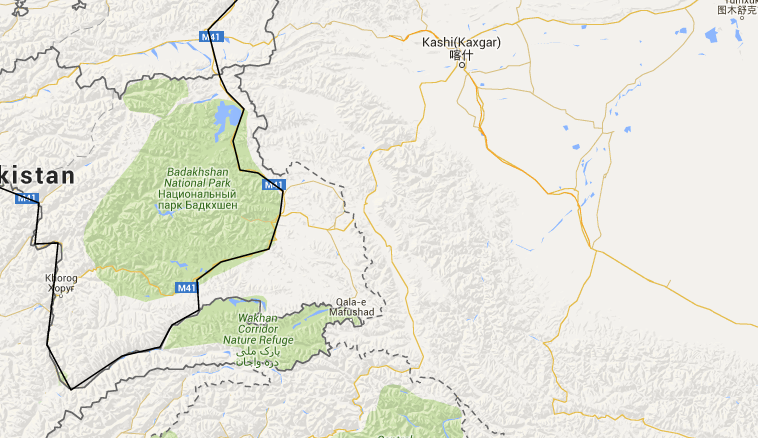 It must be one of the highest border crossings in the world. 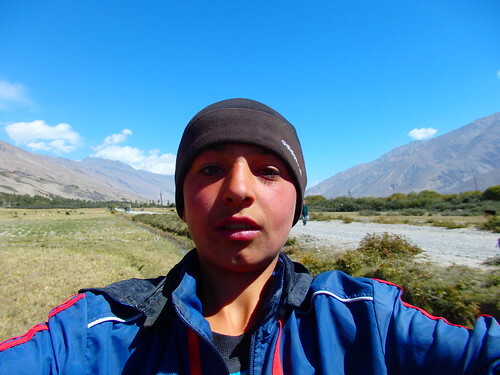 I rolled down the other side and into Kyrgyzstan. Well actually, into the 20km wide no-man’s-land between the countries. But I’ll stop this post here. 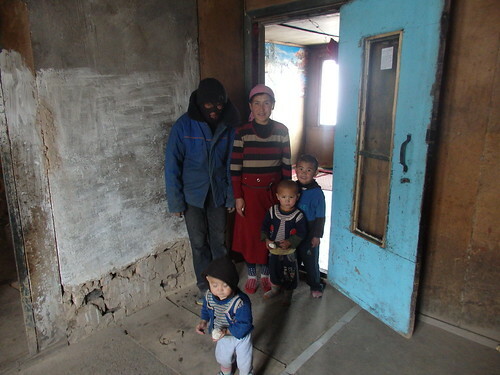 Tajikisan was every bit as weird and wonderful as I’d hoped it would be. Everyday was an adventure and a beautiful one at that. My first taste of winter was unpleasant but the wonderful people I met along the way made up for that and then some. 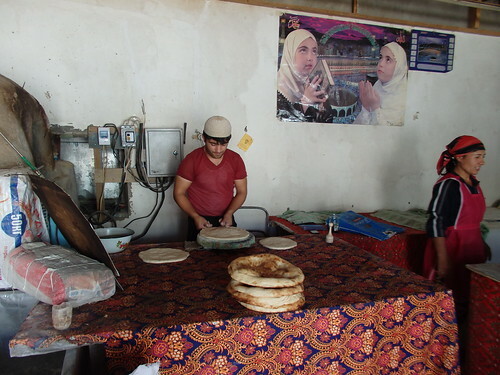 Ps: Bertrand (the Frenchman I was cycling with in Tajikistan Part 1) makes some amazing videos of his trip over at his blog ‘A Slice of Life‘. Me and my silly helmet hat were lucky enough to feature amongst some stunning mountain shots in his Tajikistan film… Check it out! jkb – that all looks absolutely amazing. such a good read. thighs of steel!